Magento Sitemap - How to do google verification? Google verification is something that every store owner needs to have if it is associated with Google services. If you are the owner of your Magento eCommerce store then you have to go through the Google verification process. 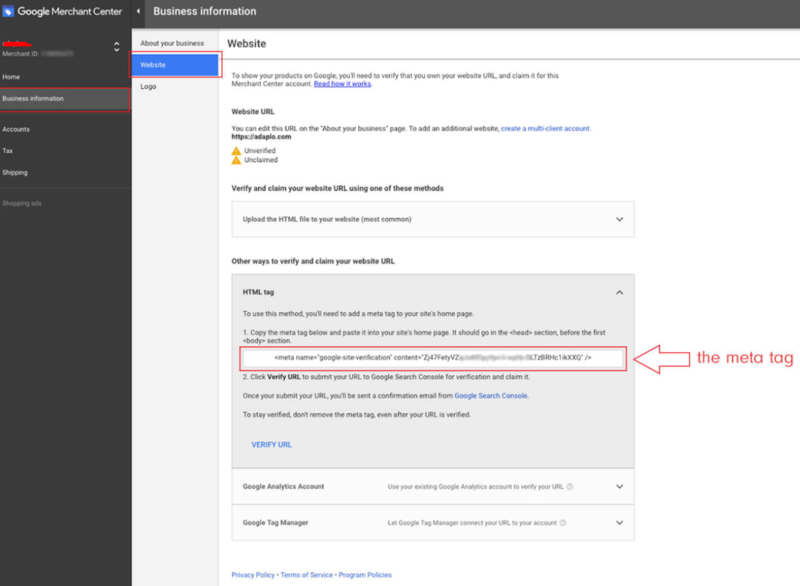 So, GOOGLE has all access to your website for indexing according to your Magento Sitemap. Hence, you can easily diagnose and fix SEO problems on your website. Also by taking this step, you can optimize your organic traffic. Here in this article, we will show you how you can pass the Google verification for your Magento website. So, GOOGLE can index your site according to the Magento Sitemap. However, a Creating Magento Sitemap or Google verification needs to be done in a specific way because the total indexing process is very dependable over these factors. So, in that instance, it is always a better idea to hire an expert. However, if you are an honorable client of our hosting which provides 24/7 customer support, then just contact to our web development support and they’ll do this in minutes for you. These services are free of any cost with our dedicated Magento 2.0 hosting plans. Have a look at our SSD Magento Hosting plans!!! Tanzia farin Chy for Aspiration Hosting!!! How to verify your Magento web store via Google Merchant Center? Simply uploading the HTML file to your website Root. By using the HTML Tag – the most simple way. In this article, we ’ll show how to do this in this post. For each process, there are both positive and negative things to consider. Positive – The easiest way is simply to upload the HTML file into the web ROOT folder. Hence, one thing that should be kept in mind is that the file should be publicly accessible to everyone through the URL. It should be the URL MC is pointing out. Once it is done you can claim your store in Google Merchant Center. So you can also verify your site with GOOGLE. Later GOOGLE will start indexing your contents for search engine results. Negative – It will demand access to your web server. Furthermore, to upload the file you will need to hire a web developer. Positive – In short, HTML Tag method is an easier method to claim your Magento store. Thus to claim and verify all you need to put the meta tag inside the head section of the eCommerce website. Hence by using the admin panel, anyone can easily do this. Next GOOGLE will start indexing your contents as per Magento Sitemap. Negative – In my case, I found it as an extremely easy process and has nothing much to say about it. Positive – In Google Analytics method inside of your head section you have to put the asynchronous code. Next, through Google Analytics you can easily ‘edit’ the permissions. Further, you can easily claim the eCommerce site. Negative – It requires asynchronous Google Analytics code. Furthermore, right permissions access on Google Analytics is also required. Because Google needs the rights to index your site according to your Magento Sitemap. Negative – Google tag manager should be already set up. Furthermore, you need a developer to insert the code. Finally, among all the above-described methods HTML tag method is the most efficient and quickest I have found in my experience. Because in this method you can easily verify and claim your Magento web store. Here we do not need to take any help from Technical experts. On the other hand, no need to ask for any permissions from other sources. 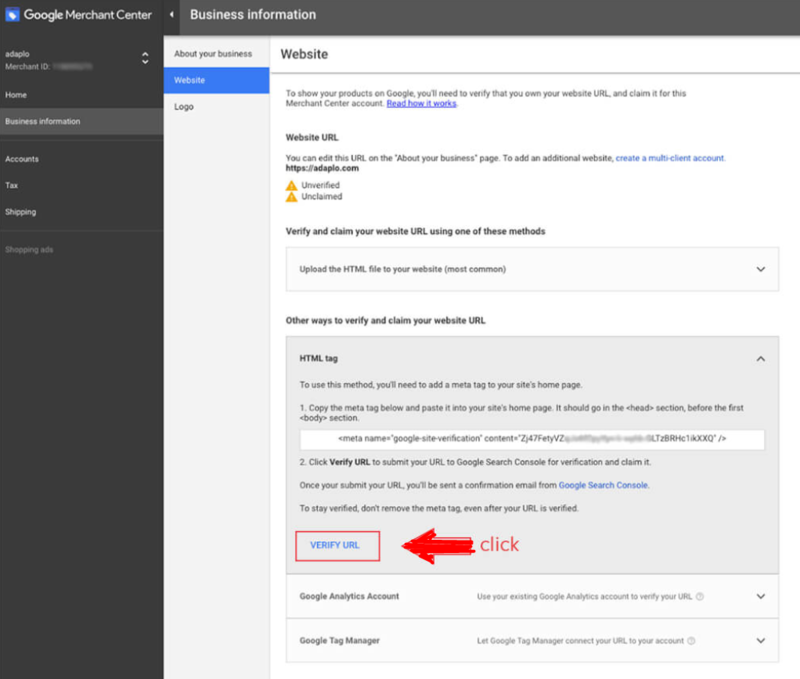 Simply follow the steps to verify your website with GOOGLE. So, GOOGLE can access the store and Magento Sitemap for indexing. Copy from MC the meta tag that is given to your store. 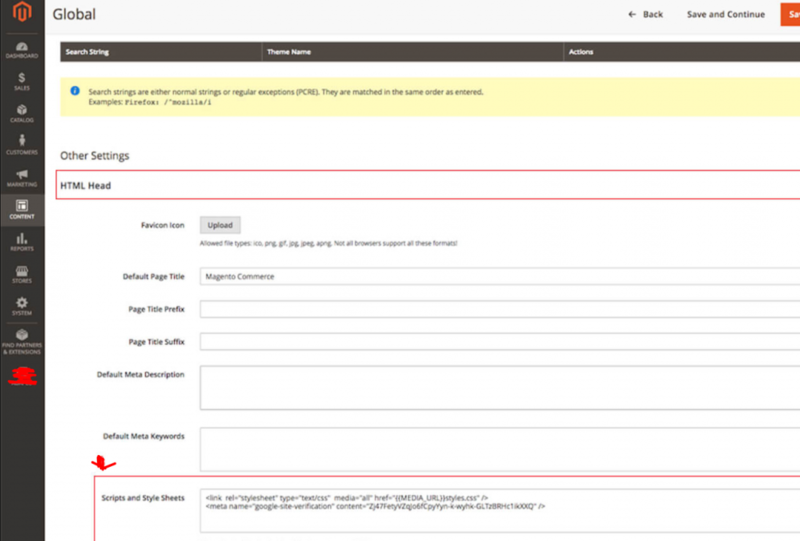 Insert the copied meta tag to the head section after login to your Magento admin panel. Go to Store and then to the Configuration. 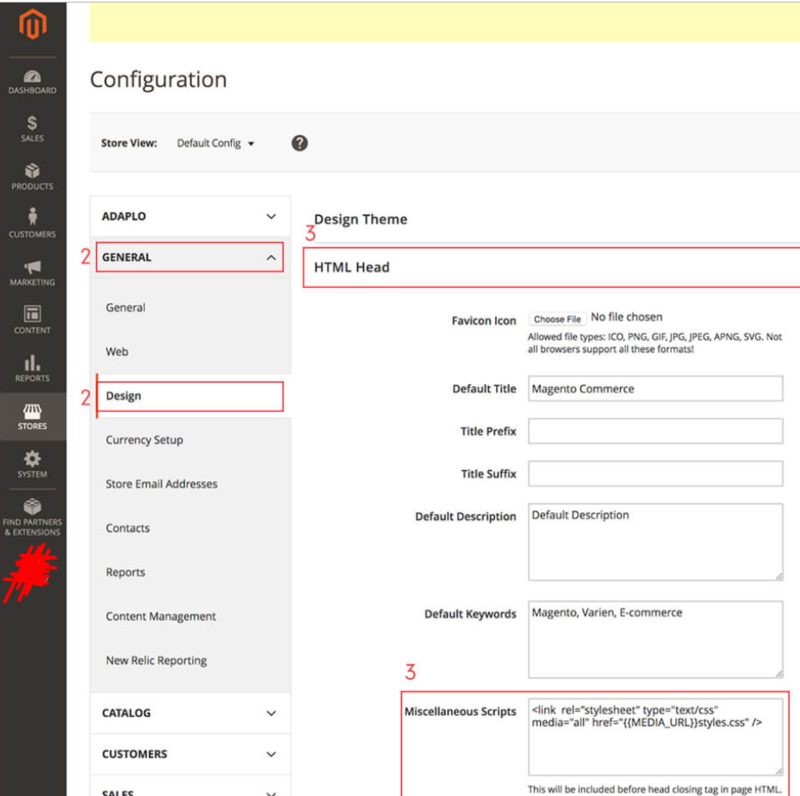 For Magento 2.0 find the options similarly according to the ScreenShot. Look for section General and then Design. Then under the HTML head section find the Miscellaneous Scripts section. In the Miscellaneous text-box paste your meta tag code. First, log in to the admin panel. 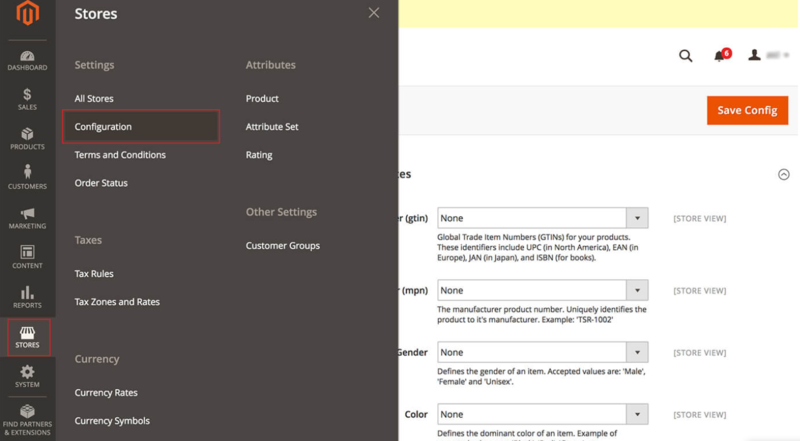 Now navigate to the Content and the find Configuration. For your current theme or global theme press ‘edit’. Next Open the HTML Head section. Now paste the meta tag code in the Scripts and Style Sheets’ s section. In the top right corner press the ‘Save Configuration’ button. After all, we have gone through the above-mentioned process. In the final process go to merchants.google.com and press verify URL. Once you have successfully verified the URL, you will be able to see this picture provided below. In conclusion, you can easily verify and claim your Magento store by following these process. Moreover, if you don’t want to break a sweat you can skip these process. Therefore, the whole claiming process will be provided by us – Aspiration Hosting! Read our previous article on Magento Sitemaps – How to create Magento Sitemap?